Chicken shawarma is traditionally prepared on a vertical, rotating spit over open flames. As a result, it can be challenging to prepare an authentic version of this dish at home. Fortunately, this tasty recipe delivers great shawarma flavour using tools you probably already have in your kitchen. Tip: For quick make-ahead meals, double or triple this recipe and prepare several freezers bags with chicken and marinade at once. Then, place each bag in freezer until ready to use. Pull out a bag the night before preparing to give the chicken a chance to defrost and marinade at the same time. 1. In a medium bowl, combine garlic, spices, lemon juice, and extra virgin olive oil. Season with salt and black pepper, to taste, and whisk to combine. 2. Place chicken thighs in a large, sealable plastic bag and pour marinade mixture on top. Seal the bag and gently turn to thoroughly coat chicken. Place in the refrigerator for several hours to overnight. 3. To prepare the yogurt sauce, combine all ingredients in a glass or other non-reactive bowl and stir to combine. Cover and place in the refrigerator until ready to use. 4. Heat olive oil in a large skillet over medium-high heat. Remove chicken from bag and discard remaining marinade. Add the chicken to the hot skillet and brown on each side, approximately 2 minutes per side. Season with additional salt and black pepper, if desired. 5. Reduce heat to medium and continue cooking until chicken is cooked through, approximately 6-7 minutes per side. Remove from heat and let cool for several minutes. 6. 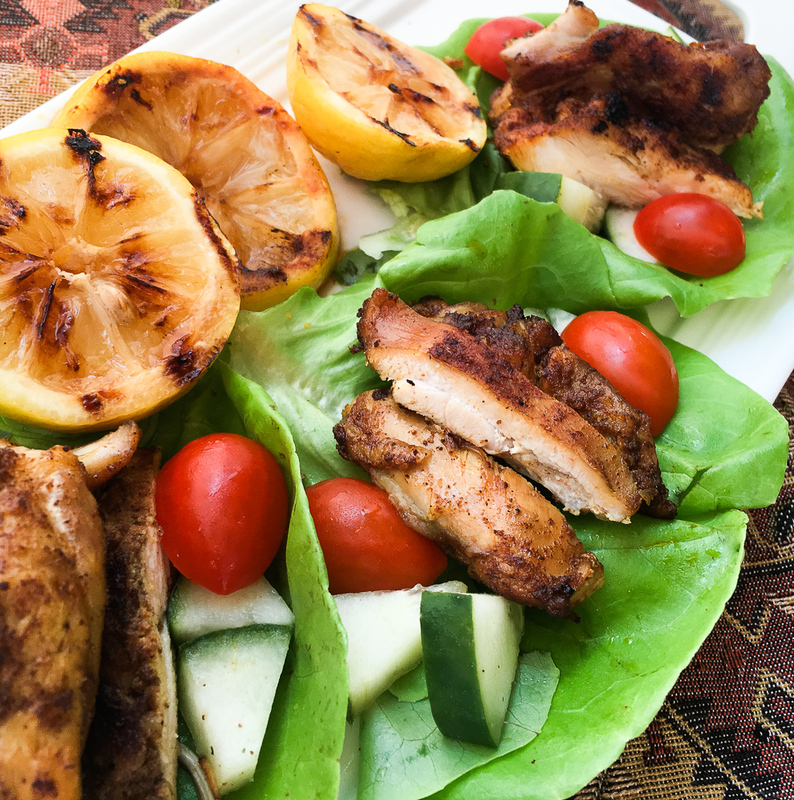 Slice chicken and arrange on lettuce leaves and top with tomatoes and cucumbers. Drizzle with Greek yogurt dressing and serve immediately. Alternatively you can use fajita wraps to parcel everything up.